It’s a melting pot, for people around the world. It’s a Mecca, for hippies. It must be admitted that Poppies is a haven of hippies. Narrow streets, the loud music, a row of bars, frenetic atmosphere, and happiness mingled here. Kuta became a melting pot of nations in appreciating good music. If you want to measure the condition of Balinese music scene today, visits to various bars and nightlife venues in the Poppies is a must! 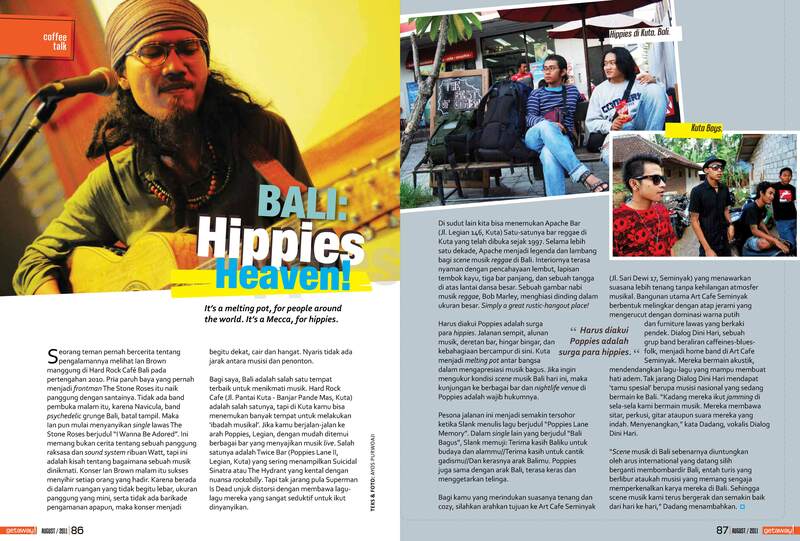 Ayos report about music life in Kuta and Seminyak was published on Getaway! Magazine, August 2011 issue. At the same issue, also published short feature about Padang by Lukman Simbah.